Should You Really Get Pet This Christmas? It seems perfect, right? The family has been talking about getting a pet why not surprise them? The kids need more responsibility, a pet would be the perfect way to give them that. But it’s not always perfect. Here are some things to consider before you get a pet this Christmas. #1. Does Everyone Want A Pet? Before you set out to get a pet you might want to make sure everyone is on board with the idea. Everyone should also agree on what kind of pet your family might want. While you are thinking of a cute little kitten, your family is thinking more along the lines of a Golden Retriever. #2. Aren’t you Already Busy? Christmas is a very busy time of year for everyone. There is shopping to do, presents to wrap, parties to attend, and family to entertain. And what about after the holidays? There is work, school events, afterschool programs, and so much more. Puppies and kittens require a lot of work! Are you going to able to add that to your schedule? Puppies need training, playtime and frequent potty breaks. Kittens need playtime too, as well as training (yes, I said training). Routine is important for any animal, so make sure you can keep your pet on a regular schedule before you get a pet this Christmas. Christmas is a particularly hectic time with family and friends dropping by to celebrate and exchange gifts. Your doors will continually be opening and closing. This is the perfect opportunity for your new puppy or kitten to get lost in the shuffle of Christmas celebrations. Veterinary care – From initial vaccinations to monthly heartworm treatment. There is also the accident or illness that may happen. And don’t forget your pet requires a yearly check-up just like you. Supplies – There’s food, toys, beds, carriers, treats, leashes, bowls, collars and so much more. Daily care – If you decide to get a puppy what will you do with that puppy every day that you are at work and the kids are in school? Puppies need to get out to go potty and eat in the middle of the day. If you can’t come home during the day, you will have to hire a dog walker to come in to care for your puppy while you are at work. Kittens also need a lot of personal interaction and feedings, so unless you already have other pets in the house and open feeding your kitten will need attention during the day also. A pet sitter is a great way to socialize your kitten as well as provide much-needed playtime and food. This list only scratches the surface of the costs that can arise. #5. Are You in It For the Long Haul? So you get a pet this Christmas, but it will be with you for many Christmases to come. A dog or cat is a long-term commitment. Our shelters are overflowing as it is and after the holidays it gets worse. Pets are not something to play with on Christmas break and the discard at the animal shelter when it gets too difficult or costly. Cats and dogs can live for 20+ years. Are you willing to make that commitment? What are your future plans? Are you moving? Traveling? Planning a family? How will your pet fit into your life not only now, but in the future? #6. Do You Have Other Pets? 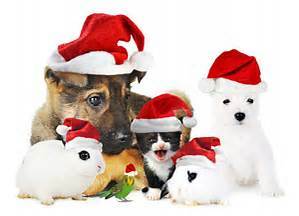 Before you get a pet this Christmas, take the pets you already have into consideration? Christmas time is very stressful for everyone, including your pets. It might be a good idea to wait until after the holidays, when everything has calmed down, before adding another pet to your family. How will your current pets accept a new pet into the family? Remember, most of your pet care costs are going to double when you add another pet to the family. If you have decided to get a pet this Christmas, please consider adopting from your local rescue or animal shelter after the Christmas holiday. This will give your pet time to adjust to its new environment and you will be saving a life. Millions of unwanted pets are euthanized each year across the United States. These unwanted pets are wonderful animals (I know I have six) who just need a family to love them. Most rescues and shelters offer gift certificates and you can make it a fun family outing after the holidays, while still giving the kids something to open on Christmas day. How can Dances with Dogs help? Our Professional Pet Services can take some of the pressure off your busy schedule as well as help you with training your new dog or cat. Contact us!